I decided to give this old bench a thinned paint whitewashing as well as the lobelia frame from the other day. Annual baby's breath is planted in the tool box, and the pails have annual hot pink petunias, lobelia, calibrachoa, and verbena. The bird houses are semi-attached with a finishing nail pounded into the deck rail and a small hole in the birdhouse bottom slid over the finishing nail. The "Flower" stencil I added to the old galvanized tool box is from the *Old Sign Stencils Collection. I picked up a small old window that last week that I nailed to the deck rail. 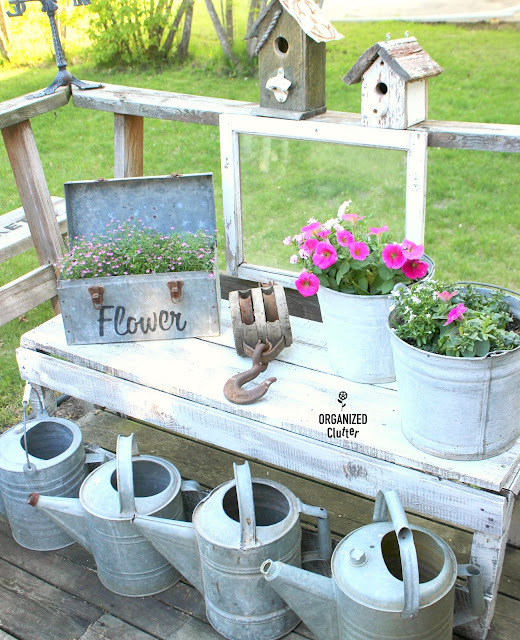 I like this fun, updated and bright "garden junk" vignette on the corner of my deck! Oh Carlene... your garden junk always makes me smile! These are stunning pictures! And you truly turned that toolbox into a must have... it's gorgeous! This is cute! 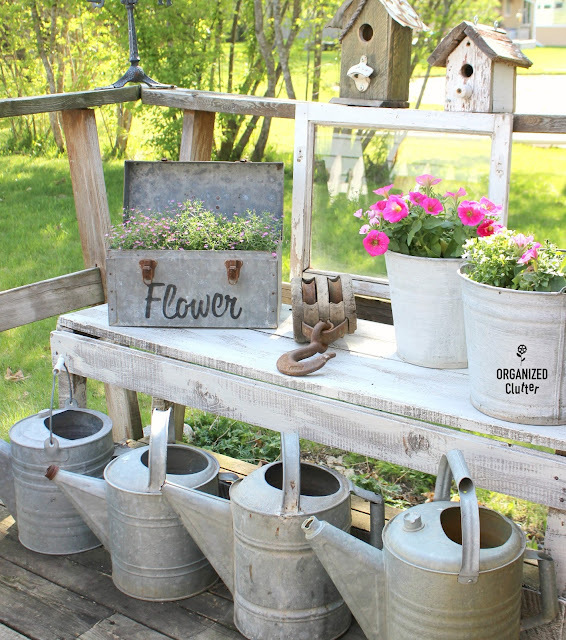 I like the watering cans staged there too. I j use got my annuals planted (had to wait for the frosts to stop). I have an old double bucket that was my Dad's that I should plant something in. Fun inspiration! I have a certain affinity for the watering cans. Love your ideas, Carlene! 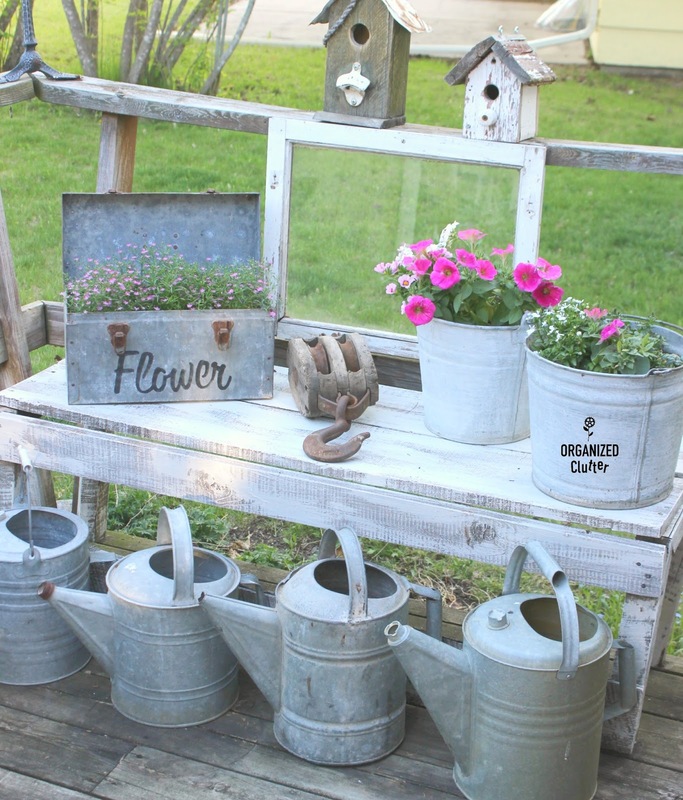 Your garden vignette looks beautiful, Carlene! 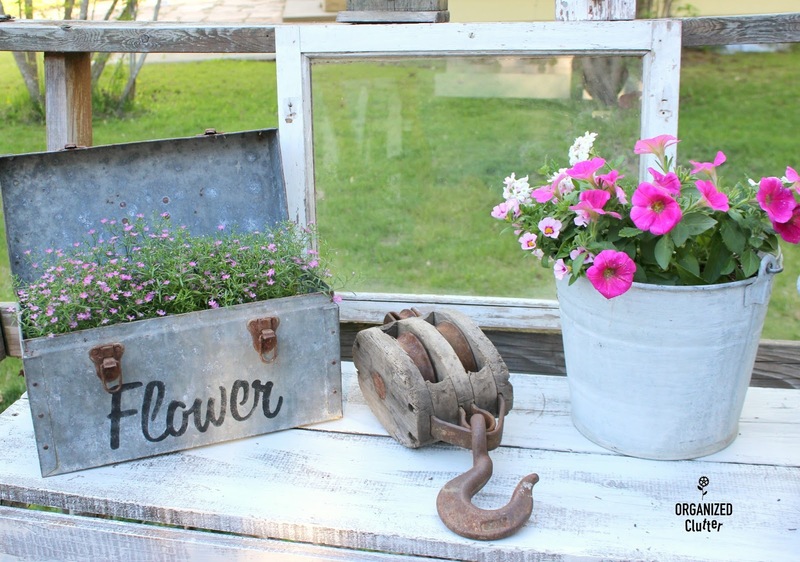 I love your watering can collection and your repurposed tool box. Beautiful ... So wish I could get my flowers to grow as pretty as you do. Everything you plant is so showy in your junk garden. Smart way to mount your birdhouses on the porch rail. Glad you are having good weather. Need your street address please, so I can come steal some stuff in the middle of the night?? ?